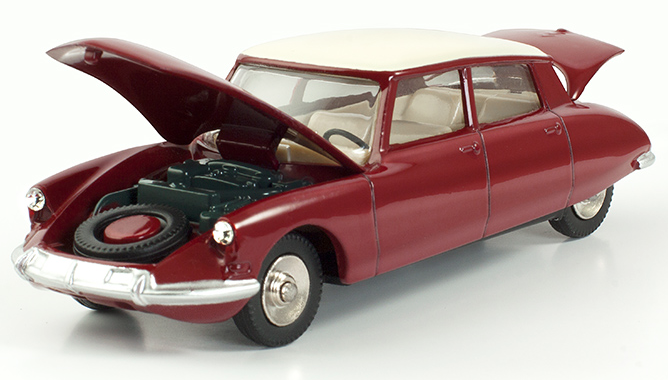 THE CITROEN DS19 MAY NOT BE a powerful sporting Corvette Sting Ray or Jaguar E-Type, but as one of the prettiest passenger cars ever made, it is certainly a good choice as loss leader (price just 2.99 Euro) for a new Dinky Toys collection from Les Editions Atlas. David Jefferis: I might not have chosen to model the car in that particular shade of garnet red, but it doesn't detract from what is a nicely reproduced miniature 1:43 scale model. "The story begins with the official re-release of the DS 19 ref. 530. ATLAS Editions decided to let you rediscover this sophisticated model, much sought after by collectors today. 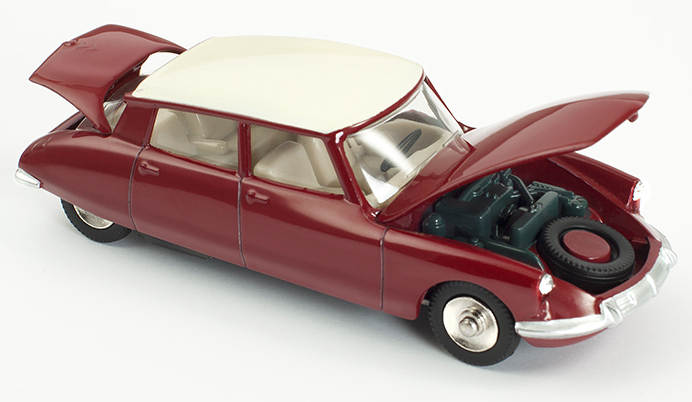 "Garnet and roof ivory finish, this reissue of the DS 19 is provided with amenities lacking on older models Dinky Toys, such as: fuel filler door, and other interior fittings. 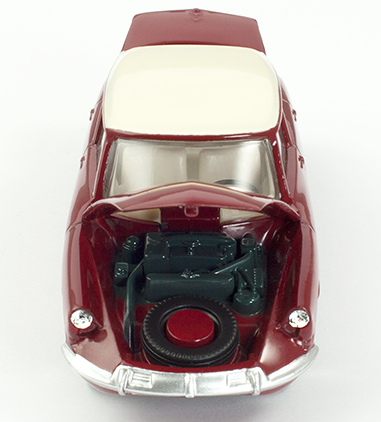 "This miniature car will bring back the child in you and delight the most avid collectors! Of course, more than ever, this sublime Citroën DS 19 ref. 530 will be delivered in the famous yellow box, illustrated by John Massé, in a realistic style and who painted a flying club backdrop, a popular destination for families at the time. "This miniature will be accompanied by a documentary book, rich in historical photos and stories about the fabulous precious DS 19, and a certificate of authenticity stating that it is an official reissue. "And with this collector's item, you will receive the gift pin Dinky Toys, which is a replica of the badge that the workers were in the factory in Bobigny in the 1960s." The promo video (below) is interesting to watch, whether or not you speak French. It's delivered by Dinky Toys expert Jean-Michel Roulet, who knows the subject inside and out. 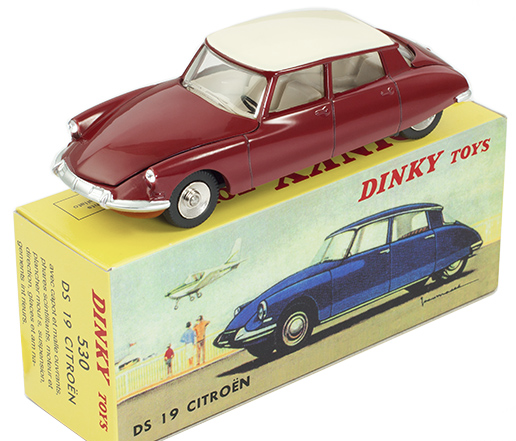 Click here for full details of the Dinky Toy Collection. Dinky Toys Books and Models here.